If you want your trees to looks at their best, you need to consider working with the best tree service company in Lansing, Michigan. Thankfully, we are here to offer you a stellar tree trimming service that you can rely on. We are here to help you trim your trees fast and easy. 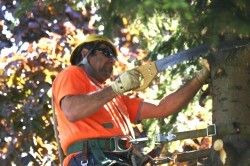 We are a professional team of arborists ready to handle any type of inquiry. We are fully committed to value and we believe that the best approach comes from trimming the trees fast and easy. On top of that, our services are affordable. We are always here to bring you a great value for your money and that will definitely impress you right off the bat. We are bringing in more than 10 years of experience in the industry and the utmost commitment to value. We believe that nothing is impossible if you work with a team that you trust. Once you contact us, a team of experts will come to you and we will provide you with a free analysis and an estimate. Based on that estimate, you will know what to do, if you afford the cost or not. Thankfully, our team always provides the very best and least expensive prices on the market, so the experience can be second to none at all time. We believe that professionalism is very important and that’s why we have reliable and high quality trimming tools that will bring you an outstanding experience and the very best value that you can find on the market. Aside from offering a very impressive set of visuals to your home, our tree trimming service in Lansing is designed to keep the trees safe. In fact, our main focus is to not damage your trees in any possible way. We think that tree safety is mandatory and, as a professional tree service company in Lansing, Michigan, we take all the right precautions. At the end of the day, nothing is impossible and you will be very impressed by our unique approach. Plus, we are very reliable and we believe that quality is mandatory. This is why you should consider working with us, because we are 100% focused on value, quality and we deliver a stellar experience regardless of the situation. And as if that was not enough, we also believe that cleanliness is mandatory. We are determined to keep the workplace safe and because of that we will do all in our power to eliminate any signs of tree trimming. Since you know the costs, duration and all the other information, you are always informed about everything we offer. As a result, you will enjoy the experience and you will be impressed with the unique value delivered here. We believe that nothing is impossible, as long as you hire us and work closely with our team, your tree trimming requirements will be brought to life in the most delightful and impressive way you always wanted! Hire our team right now and get the best tree trimming services offered by a tree service company in Lansing, Michigan!